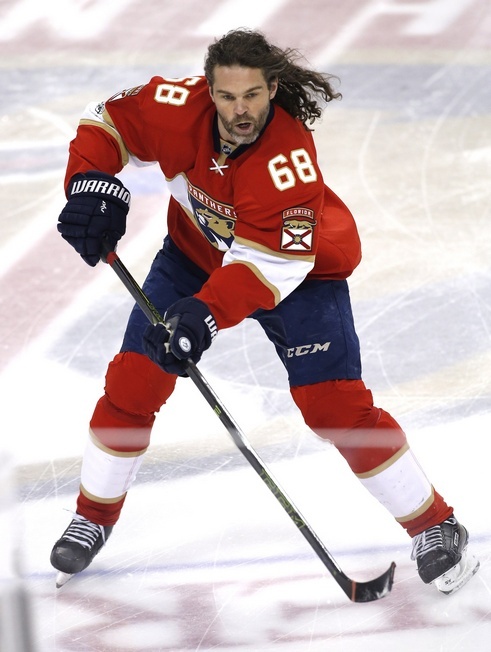 The Florida Panthers are talking to Jaromir Jagr about a new contract. The 45-year-old is set to become a free agent on July 1 and is coming off a one-year contract with the Panthers worth a $5.15 million NHL cap hit. It is believed that the upcoming NHL Expansion Draft could play a role in how Florida handles the situation. The contract will likely not come into play until after the Vegas Golden Knights compose their roster, as signing Jagr prior to that would mean they’d have to toss him on their protected list. Teams have to protect seven forwards, three defencemen and one goalie. Players with no-movement clauses must be protected unless he’s willing to waive it. Teams will have to submit their lists of protected players by June 17, while Vegas has until June 21 to submit its roster selections. Vegas can snag any restricted or unrestricted free agent left unprotected. For his part, Jagr is still earning his paycheques and the Panthers would love to have him back in the fold. In 82 games in the 2016-2017 season, he had 16 goals and 30 assists. Eight of his goals came on the power play and two were game-winners. He had 181 shots on goal. That’s a slight decline from his 66-point campaign last season, but the Panthers took a dip in the standings. Still, there’s a lot to like about another season from Jagr. He’s only missed three games over the past two seasons and has shown remarkable durability on a young team. He could also shoot down some more records if he signs for another year and that’s an exciting prospect. Jagr needs just one power play goal to scoot past Mike Gartner on the all-time power play goal-scoring list, for instance. And he’s just 20 assists behind Ray Bourque for fourth place on the all-time assists list. But more than anything, you’ve got to believe Jagr would love to help the youthful Panthers reach for hockey’s ultimate prize at least once. The building blocks are in place in Florida, too, so another silver opportunity could come sooner than many think.